In terms of commenting on the remarkable bicycle phenomenon here, I think I have been able to hold out longer than most people when first arriving in the Netherlands. 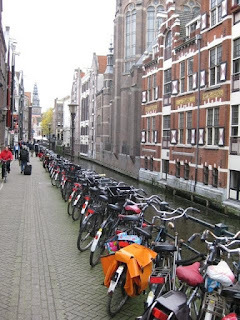 I didn't want to sound trite - Amsterdam, and Holland as a whole, is way more than red lights and bikes. But with an estimated 700,000 bikes in this city of about 740,000 people, to not say anything about it would be a little strange. 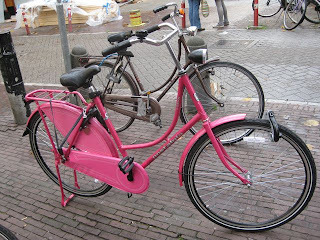 The stats say Amsterdam citizens use their "fiets" even more than their car - using them .87 times per day, compared to .84 times per day where they use the four-wheeled mode of transportation. Environmentally-speaking, this is no small fiets. I'll save the red-light stuff for later - maybe never - and just speak of the spokes. (The Dutch even have an expression that marries the two: "Op een oude fiets moet je leren" - "You need to learn on an old bike." And trust me, there are all kinds of old bikes available in the red light district, with many enthusiastic-looking groups of young, er, cyclists. But I digress. Biking here is the preferred mode of transport - particularly in Amsterdam, with its narrow streets not suited for large amounts of vehicle traffic. And cyclists come first - as far as I can tell, it's bikes, then scooters, then cars, then pedestrians in the traffic pecking order. And a word to the wise for my Western Canadian friends who are used to stepping off the sidewalk and having the world screech to a halt for you - doing so here, as in most international cities, will result in you getting brained by a truck's mirror or run over by a scooter. Bikes are incredibly silent, and bells are used sparingly. You need to keep your head up at all times - getting off the tram, crossing the street (including pedestrian-only streets), and jogging anywhere. Getting almost run over is not solely the domain of young punks. You are as likely to lose your toes or your nose to a cellphone-wielding supermodel as you are a 65-year-old grandmother. One of the more enjoyable activities? Watching tourists (I say so without derision - give me a few more weeks for that) on their rental bikes for the first time. Their expression - "Whee, look at me...yay, biking!" - quickly turns into shock, followed by hardened, street-wise savvy after the first tram turns the corner and almost takes off their front wheel along with their face. This is good - it builds character. Once the bars clear out in this almost taxi-less city, packs of people anywhere from 18-45 head home a little wobbly. Pedal Alcohol Syndrome, call it. They are still pretty adept at avoiding sober pedestrians though, so not to worry. Bike theft is apparently rampant here - so much so that a local friend tells me it has come full circle over the years; he's had 4 bikes stolen, including one the first day that it saw pavement. But, resolute and practical as most Dutchmen (and women) are, he has resigned himself to this and has bought two or three bikes of his own - even ordering a style of bike once - from, er, non-bike owners. With so many thousands of bikes on the road all the time, some people choose to customize them as much as an L.A. gang member tricks out his car. I should buy the rights to air "Pimp My Fiets". (More examples/photos hopefully on a future post). Singing cyclists are a very pleasant thing to see and to hear. Again, there is no age or race to classify the people in this group - a chubby African guy one morning, belting out a Dutch pop song; and a slender blonde female university student the next, humming pleasantly while biking past at Mach 3. And on my own rental the other day, apartment-hunting along the waterfront, I found it impossible to not quietly throw out a few lyrics of my own (I forget what song - something from Bichael Jackson? Bike and the Mechanics? Feel free to add your own suggestions in the comments field below). I'm not sure where the biking-breeds-singing link stems from, but it's real.